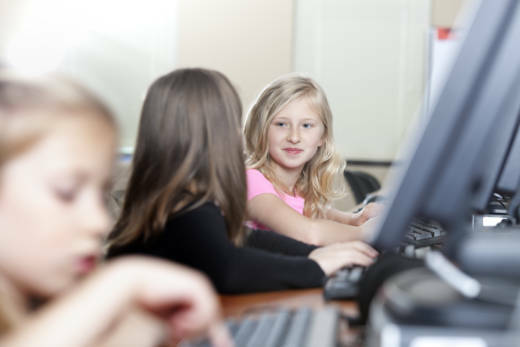 Can Personalized Learning Flourish Within A Traditional System? The goal of personalized learning is to tailor lessons for individual students to help them master content on their own schedule, whether it’s faster or slower than their same-age peers. At its most extreme, personalized learning can also unfetter kids to study whatever they’re most interested in, although experts say most schools still require students to cover key subjects and skills. The new educational philosophy has spread from Maine to Silicon Valley, propelled by new technology making it easier for a classroom of students to work on different tasks and by passionate proponents who see it as the future for an American education system that badly needs updating. But as more schools, districts, states and even the federal government begin to embrace the idea, personalized learning is coming into conflict with an older movement in American education: standards-based accountability. Grade-level standards – the content and skills students are supposed to master each year – and the end-of-year tests that measure them aren’t forgiving to schools and teachers who stray far from the predetermined path. The consequences of failing can include sanctions for schools and teachers, and even school closure, and now the standards are more rigorous with 40-plus states having adopted the Common Core State Standards. The rigidity of the current standards-based system could present a problem as personalized learning tries to grow – although some hope advocates on both sides will find compromise that strengthen both ideas. The standards movement, driven by fears that American students were falling behind their international counterparts, has dominated U.S. education reform since the 1990s. Reformers sought to raise the rigor of American classrooms and shine a light on achievement gaps between high-needs groups and their peers. Standardized testing, enshrined by the federal No Child Left Behind Act in 2002, became the method of holding schools to account to ensure they were helping disadvantaged groups catch up. “The standards movement was intended as a way to say, hold up, if we are holding kids who are coming in more ready to learn to higher standards than kids who need extra help, then what we’re effectively doing is perpetuating the achievement gap over time,” said Kathleen Porter-Magee, a fellow at the Thomas B. Fordham Institute, a right-leaning think tank. But the standards movement has faced a backlash in recent years after a majority of states, urged on by the federal government, adopted the controversial Common Core standards. A motley coalition of teachers unions, parents, and politicians and activists from both the left and right fought against Common Core and the new standardized tests linked to it. Common Core still stands in most states, but many have tweaked the standards and changed the name to something less politically charged. At the same time, the new federal education law passed last year has removed some of No Child Left Behind’s teeth. Yet, though the standards movement may be weakened, it seems unlikely a freer approach to education in the form of personalized learning-for-all will take its place – or that it should. Most personalized learning advocates wouldn’t disagree. Although personalized learning supporters say they want even more changes to the current structure of standards-based accountability, many also are adamant that high standards are compatible and even necessary for their movement to keep up its momentum. The ideal, both according to personalized learning backers like Greenberg and supporters of standards like Porter-Magee, would be a system where the two education philosophies not only coexist, but strengthen each other. One proposal is standardized tests that kids take when they’re ready, over the course of three years, say, instead of every spring. In the meantime, Brian Greenberg believes the best schools should be able to handle both. To read about how personalized learning is growing in schools, check out this report by Nichole Dobo. This story was produced by The Hechinger Report, a nonprofit, independent news organization focused on inequality and innovation in education.